The cute little Lower Parel bakery has an extensive range of desserts. 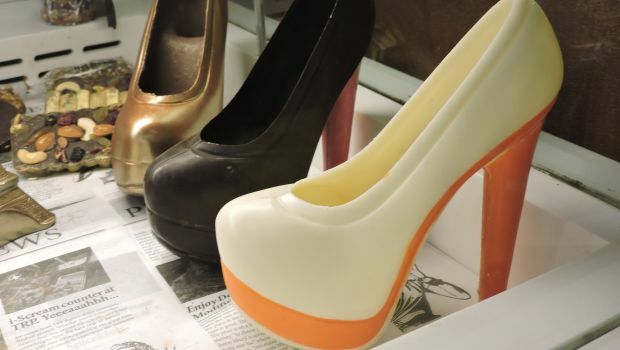 The chocolate shoe is made of pure Belgian chocolate. They say diamonds are a girl’s best friend, but chocolates and beautiful stilettos aren’t too far either. The Rolling Pin boulangerie in Mumbai is fusing the two and we can’t help but go absolutely head over heels for the delicious combination. 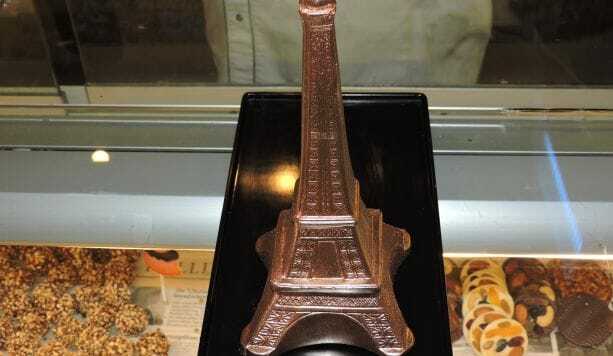 The cute little Lower Parel bakery has all of Mumbai fixated on its extensive range of decadent desserts and its quirky inventions such as ice cream burger, macaroon burgers, Belgian milk chocolate bars, chocolate pizza and chocolate stilettos. And that is not all, The Rolling Pin also consists of many other such sinfully indulgent and artful desserts like the Ice Cream Burger. Dig in to the delicious chocolate ice cream burger sandwiched between chocolate buns, and vanilla cheese slice. There are vanilla fingers and strawberry sauce to go with it too. You can also try their Macaroon Burger with decadent and flavourful cream frosting. The Chocolate Pizza, with heaps of ice cream, cake, Nutella and chocolate sauce is the ultimate answer to your sugar cravings. The Belgian Milk Chocolate Bar, made of chocolate mousse and shaped as a chocolate bar, is sure to make you ditch all your diet plans for the day. Other most popular desserts are the Madagascar Chocolate Tart, Mississippi Mud Pie, Belgian Chocolate Granola, Mixed Fruit Tart, and Red Velvet Cheesecake. The quirky and quaint little baker also has something for your savoury cravings too. Try their Samosa Pav, Mexican Bhel, Crispy Cheese Sticks and Spinach Corn Quiche for a delicious and wholesome experience. Previous article What are the dietary requirements of racehorses that keep them fast, strong and healthy for a performance?